At least that’s my first impression. Still just dipping my toes in. 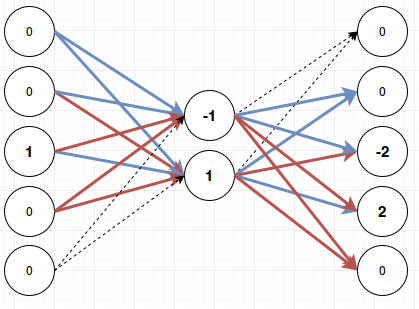 But there is one thing I am very impressed with: How much data neural networks can express in how few connections. If you count the number of connections on that last picture you will notice that there are fewer than there were in the first network. There were 5*5=25 at first, now there are 5*2*2=20. That reduction would be larger if I had more input and output nodes. 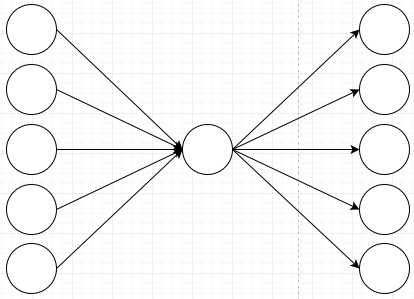 For 10 nodes that reduction would be from 100 connections down to 40 when inserting two nodes in the middle. That’s where the compression in the title of this blog post comes from. That one node in the middle messes up the ability for my network to learn my very simple rule. 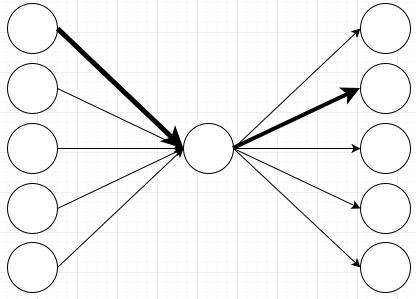 This network can not learn different behaviors for different input nodes because they all have to go through that one node in the middle. Remember that the node in the middle just adds all of its inputs, so it can not have different behaviors depending on which input it receives. The information of where a value came from gets lost in the summation. The first node activates both the middle nodes. That activates the second output node with weight two. 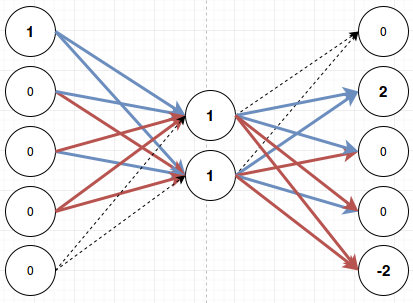 The next two nodes are canceled out because they receive a positive weight from one of the middle nodes and a negative weight from the other. The last node is activated with weight -2. If I then run softmax on this only the top node will fire. 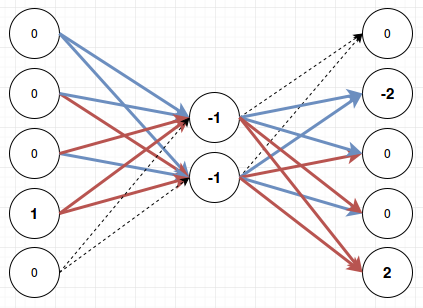 Meaning the bottom node will not fire a negative output. Softmax suppresses everything except for the most active node. That is a lot of connections and a lot of numbers. The network has now decided to make some connections stronger and other connections weaker. I couldn’t keep using colors and line-style to visualize different strengths because now there are a lot of different values. Whenever I tried to simplify and not use numbers I’d break the network. So instead I just show the numbers. 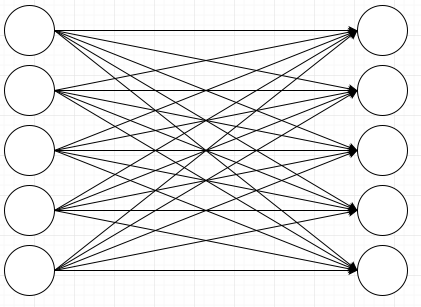 The upper number on each node is the weight of the connection to/from the upper node in the middle layer, and the lower number is the weight of the connection to/from the lower node in the middle layer. The node with the largest output value (72 = -10 * -4 + 8 * 4) is the one we want to fire, and softmax will select that. In this picture I’m just multiplying the numbers linearly because the weights on the left actually already have tanh applied (and were then multiplied by 10 to get them into the range -10 to 10 which is slightly nicer for pictures than the range -1 to 1). I can do that in this case since I only ever fire one input. And if I can just do linear math the example is easier to follow. Here also for my given input n, output n+1 had the highest value at the end and softmax will make that output fire. You could go through a couple more examples and convince yourself that this network has learned the pattern that I want it to learn. I don’t know about you, but I think this is quite impressive. For the small first network I think I could have figured out how to put the numbers in manually. (once you know the trick that the nodes can cancel each other out it’s easy) For all the connections on the larger network you would have to be very good at balancing these weights, and I honestly don’t think I could have done this by hand. The neural network however seems to just figure this out. Or rather: it figures this out if you use a tanh layer in the middle and a softmax layer at the end. If you don’t, it will stop working. Since I’m using real numbers now I might as well explain how softmax works. Softmax uses the number at the end as an exponent and then normalizes the column afterwards. If I use 2^x it should be obvious that 2^56, the highest number, is a lot bigger than 2^44, the next highest number. If I have 2^56 in the column and I normalize it, all the other activations will go very close to zero and the output that I want to fire will be close to 1. Also by using an exponent I get no negative numbers. 2^-96 is just a number that’s very close to zero. The standard is to use e^x instead of 2^x, and I also use that, it’s just that as a programmer I find it easier to explain and easier to understand using powers of two. With that information I can give a bit of an intuition why this happens to work if you use tanh and softmax: When using softmax, the connections can keep on improving the chance of their desired output just by making their own weights bigger. In fact since I just used linear math in my explanation above and didn’t need to run tanh() on anything, couldn’t softmax have learned those weighs even without using a tanh layer? In theory it could, but in practice it will keep on bumping up the numbers to get small improvements and you will very quickly overflow floating point numbers. The tanh layer in the middle is then just responsible for keeping the numbers small: it clamps its outputs to the range -1 to 1, and the inputs won’t grow past a certain point either because at some point a bigger number just means that the output goes from 0.995 to 0.997. But since they can usually still get a small improvement you don’t lose that nice property of softmax where neurons can keep on edging out small improvements over each other. So if you just use softmax your weights will explode and if you just use tanh your weights will stagnate too soon before a good solution emerges. If you use both you get nice greedy behavior where the connections keep on looking for better solutions, but you also keep the weights from exploding. Now all I’ve shown is that my network can learn the rule that when input n fires, it needs to fire output n+1. 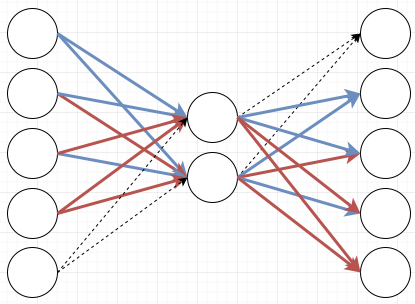 It should be easy to see that just by creating a different permutation of the weights of the connections I can teach my network that for any input neuron x, it should fire any other output neuron y. The impressive part is that without the middle layer I would have needed 11*11 = 121 connections to have a network that can learn any combination, and with that middle layer I can do it in only 11*2*2 = 44 connections. 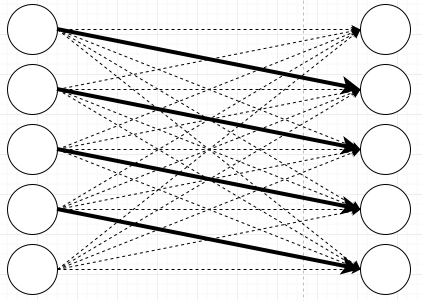 Eleven inputs and outputs is close to the limit for what you can do with two nodes in the middle. If you ask it to do much more the weights will fluctuate and they will keep on stepping on each others toes. 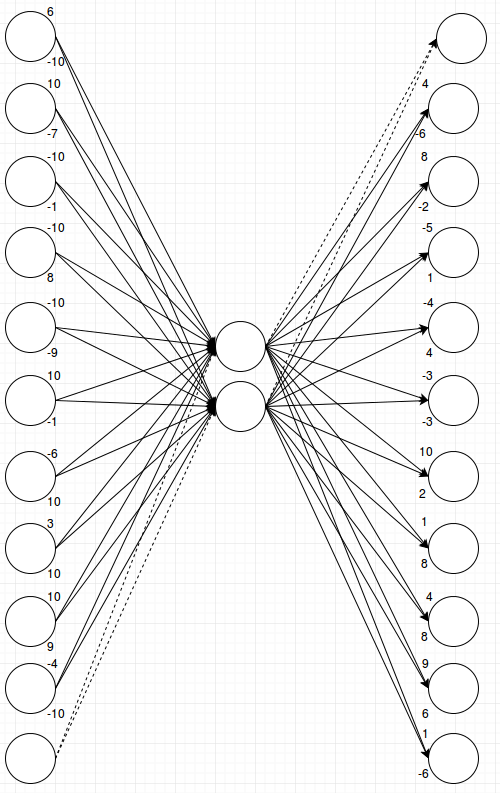 But with three nodes in the middle I can learn these patterns for something like thirty inputs and outputs, and with four nodes, I can learn direct connections for more than a hundred inputs and outputs. It doesn’t grow linearly because the number of combinations doesn’t grow linearly. 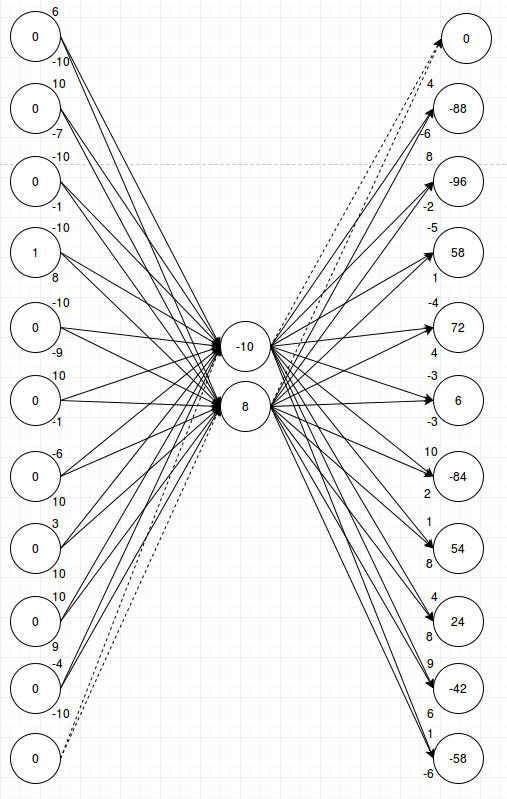 Luckily the back propagation algorithm scales with the number of connections, not with the number of combinations. So with a linear increase in computation cost I get a super-linear increase in the amount of stuff I can learn. 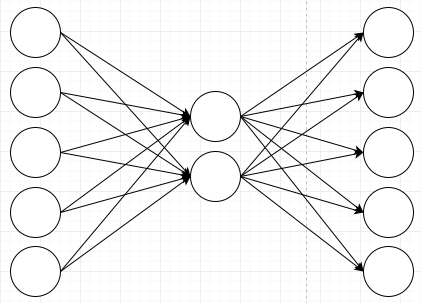 I’m still just getting started with neural networks, and real networks look nothing like my tiny examples above. I don’t know how many neurons people actually use nowadays, but even small examples talk about hundreds of neurons. At that point it’s more difficult to understand what your network has learned. You can’t visualize it as easily as the above pictures. In fact even the eleven neuron picture is difficult to understand because you can’t just look at the strong connections. Even the weak connections are important. If that middle layer had 700 neurons, then good luck getting a picture of which connections are actually important. Maybe a bunch of weak connections add up to build the output you wanted and one random strong connection suppresses all the unwanted outputs that you didn’t want. 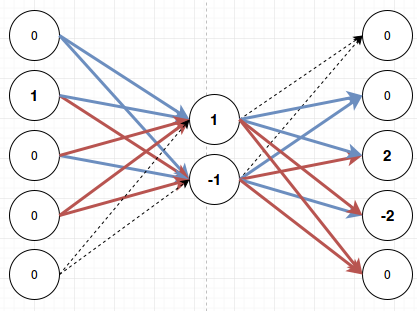 But I hope I have given you an intuition for how neural networks can compress patterns in few weights. They use the full range of the weights to the point where a connection activated with a strong input can mean something entirely different than the same connection activated with a weak input. And best of all I didn’t have to teach them to do this. They just start behaving like this if you force them to express a complex pattern in few connections. Thanks! That is indeed exactly what I’ve been constructing. I’m still new to the field and was just playing around with neurons to get a better understanding for them, so it doesn’t surprise me that this is a known thing. It’s weird how you can miss things that are blindingly obvious in hindsight. 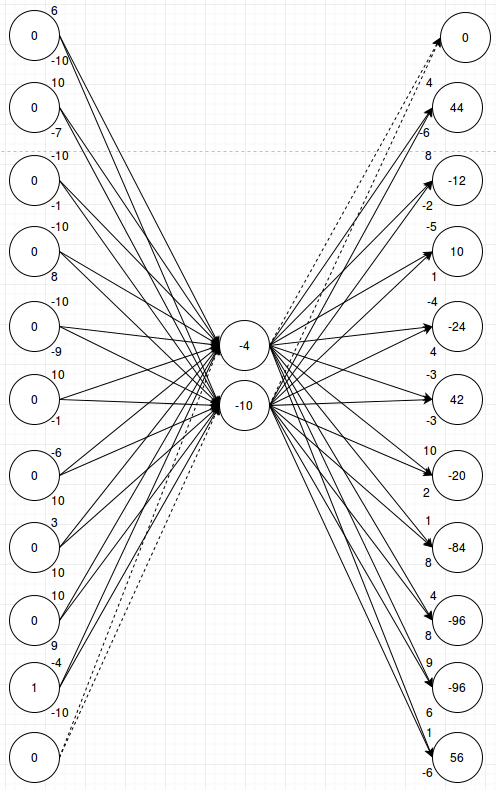 Like when I talked about permutations above I should have realized that I can just make the network learn to always make the output equal to the input. And then I can get all other patterns just by creating a permutation of the weights. That’s what auto encoders do and that would have been a simpler problem to solve and to explain, and it would have given me the same solution. I don’t know if this is relevant, but the logistic curve (which is a scaled and shifted tanh) and the normal cdf are fairly close, differing by at most 0.044. If the logistic curve is modified so that its slope match the normal cdf at zero, the difference is at most 0.017. I wonder how the results using a shifted normal cdf would differ from the tanh you use. The ones you mentioned are in there, but I don’t know why they’re not used more often. You can try Tanh, Sigmoid (which I think is what you mean when you say logistic curve) and ReLU activation functions. For the initial setup and the initial problem on the website if I select Tanh, the network arrives at a solution in something like 50 iterations. Using Sigmoid I get an approximate solution and even after more than 5000 iterations I don’t get the right solution. Trying a second time with a new random starting position it did arrive at a correct solution but took 900 iterations to get there. ReLU solves the problem in something like 30 iterations. I don’t know why Sigmoid should be so very bad at that problem. It seems on the surface to be very similar to Tanh, as you correctly point out. But for some reason it seems to be more conservative than Tanh. And sometimes that means it’s too conservative so when it arrives at an approximate solution it stays there. That’s the best reason I can give you for why Tanh is better: It seems to be less conservative than Sigmoid. I could probably give you a better reason if I spend a bit of time debugging this and watching it in more detail, but I don’t think that’s worth doing for me since I’m still new to the field. I’ll just use the things that have proven good experimentally. In many cases, ReLU and its modifications are used instead of sigmoid or tanh. The main reason is that it is much more faster. Exponential functions are very expensive when calculating sigmoid functions compared to the simplicity of ReLU. Not sure if you’ve seen this paper: http://arxiv.org/pdf/1511.06085v5.pdf but it seems that they take what you wrote about to the next level. Have you thought of entering a compression algorithm for the Hutter prize? I’m not sure if this would work for text compression. It works as long as you have nice clean patterns like I have, but the problem is that you get fuzzy results for more complex cases. Like let’s say your network is trying to learn the word “HELLO”; you have four input nodes: E, H, L, and O; and five output nodes: E, H, L, O and ‘end of text’. That setup will learn the word, but it has to learn that for the letter L it has to either output a second L or an O. Are you sure you mean “sinh”? That get very large very fast. Maybe inverse tan? Actually worth noting that contemporary research suggests the rectifier (max(x,0)) to be the most biologically plausible activation function, as it tends to create a more sparse network. But, there is no silver bullet. In that sense, I have to disagree with your “it works this way just because, and if we change it, it won’t” assertion. Yeah I like ReLU much more than tanh because it’s something that was at least arrived at by design. I can understand the motivation behind it and I can build a better mental model for it than for Tanh. I think I said a shifted sigmoid, which is, after scaling, identical to tanh. Probably the best intro article on NN that I’ve ever seen, nice work!